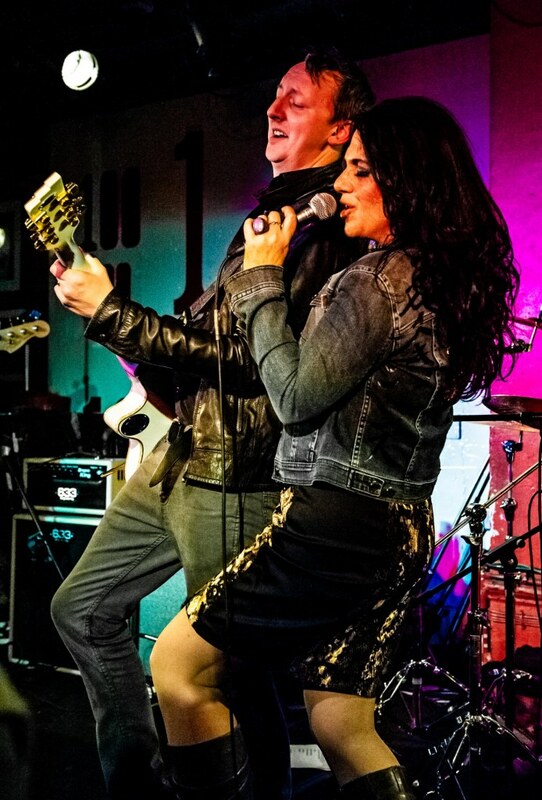 Share the post "Gig review: SARI SCHORR – 100 Club, London, 18 January 2019"
The January blues are a concept many of us are familiar with. Days are grey and nights are cold, noses are pressed to the grindstone with Christmas festivities over, and to cap it all virtue signalling campaigns encourage us to give up alcohol and now meat. It’s also a traditionally quiet month for gigs, so the term has a particularly welcome meaning with a series of concerts at Oxford Street’s venerable 100 Club badged as ‘London Blues Week’ for at least the second year running. The line up for the week also reflected the fact the blues has an increasingly proud record on gender equality, and for the final night, under the ‘ladies sing the blues’ banner, Sari Schorr was paired with Sharrie Williams. The latter, who was previously unfamiliar to me, opened proceedings and although she said it was her first London show in a decade, looked to have several committed fans. Although regular guitarist Lars Kutscke was alongside her, she borrowed many of Sari Schorr’s band, including ex-King King and now Joanne Shaw Taylor’s keyboard player Bob Fridzema, who seems to the go-to man on the current blues scene. With an act doubtless extensively honed in American blues clubs, she was compulsive watching, an extrovert character, involving the audience in clapping out a rhythm or chanting along as she weaved stories of her chequered life in song – notably on ‘Lover By Trade’, though the result was that many of them turned into lengthy jams. It took a while though for people to respond to her invitations to participate: introducing ‘Crazy for You’ early in the set, her call if anyone out there was in love drew a muted response, until my gigging partner quipped ‘that’s why it’s a blues show’! On the gutsy opener ‘Hard Drivin Woman’ she reminded me of Tina Turner, but the music drew on a wide variety of influences. Many of the songs had a gospel feel but ‘I Don’t Know What You Come to Do’ had the feel of Parliament or Sly Stone-like funk. A highly enjoyable set ended with a slow blues in ‘The World is in Trouble’ and ‘Travellin’, in which she broke into an almost James Brown improvisation, singing ‘feeling good’. Sari Schorr in contrast has been a regular visitor more recently, though my only previous experience was a semi-acoustic set supporting Robin Trower last year, which whetted the appetite sufficiently to make this a must see gig for me. She has also assembled a fine band which in addition to the aforementioned Bob, included rising blues guitarist Ash Wilson and the rhythm section of Mat Beable and Roy Martin, all of whom played tastefully and selflessly and had a real feel for the music. Songs from her brand new second album ‘Never Say Never‘ impressed, most notably the Robert Johnson tribute ‘The King of Rock n Roll’, ‘Turn the Radio On’ and an old Ian McLagan number in the title track. The band showed their paces on slower, lengthier numbers like ‘Demolition Man’ while some choice covers also adorned the set- by taking the tempo down somewhat she breathed fresh life into Bad Company’s ‘Ready For Love’ while the old Willie Dixon standard ‘I Just Wanna Make Love To You’ was given a supercharged treatment in the style that Foghat made famous. Indeed, after closing with another new song in ‘Freedom’ where Bob really let rip with his trademark Hammond organ wizardry, the first encore was a version of ‘Black Betty’ like no other. A song otherwise in danger of over familiarity was again revitalised with a radical makeover, slowed down to a mournful blues, before Ash unleashed a long solo of almost Gilmour-esque mellifluousness. Continuing the theme of ladies, he then gradually cast off his previous disciplined restraint as the storming extended rocker ‘Aunt Hazel’ closed the set. Both blues sisters had delivered a marvellously entertaining evening and a tour in February with King King, a perfect musical match incidentally, promises to consolidate Sari’s growing status as the new queen of rocking blues.